FADCS is proud to announce that we provide (technology assisted) distance counseling & coaching services. Counseling services are only available to residents of Georgia. Those that are homebound, have mobility issues or would miss an appointment due to travel. Those with hectic lifestyles or would prefer sessions from their home and/or office. Those who have recently moved and do not desire to transition to a new counselor. Check with your insurance provider to ensure that services of this nature are covered and/or eligible for reimbursement. Confidentiality is not guaranteed and becomes limited due to Internet service provider protocols, firewall settings, and/or the counselor not being able to secure your location. You are required to maintain the security of your home/office during all sessions. If security is breached, the counselor reserves the right to terminate the session. Due to technical issues, service may be temporarily interrupted. You should not use this method for behavioral health services if you are under the influence of drugs/alcohol, suicidal, self-injuring or homicidal. If you are currently feeling depressed, suicidal or desire to hurt yourself or someone else, immediately call 911 or go to your local Emergency Room to receive prompt medical treatment. 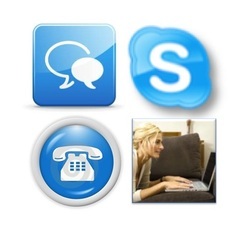 Secure and real-time chat or video conferencing via Skype: fadcounseling. Secure video conferencing via Watchitoo. Secure and encrypted email. If you choose this method, once I receive payment and a detailed description of your situation/question, I will send you an encrypted response, via your patient portal, that has evidence-based feedback/recommendations. You should receive a response within 24 – 48 hours. Associated costs for emails are $35 per email or $125 if purchased in a set of 4. *Distance counseling & coaching costs are the same as face-to-face office sessions. When considering these services, choose the method that will best address your situation/concern. Additionally, if you are interested in these services, complete the contact form below. I will follow up with the required counseling paperwork (informed consent & questionnaire that addresses your history and present need for counseling/coaching, etc.) and methods for facilitating services.